Dammam-Saudi police have foiled two attempts by the ISIS terrorist network to attack a restaurant on Tarout Island in the Eastern Province and Um al-Hamam Mosque in Qatif. Ministry spokesman Maj. Gen. Mansour al-Turki said that the first operation occurred on Friday when the security forces stopped a vehicle with two passengers at a checkpoint in Dammam. The passengers tried to escape but were arrested by security that discovered weapons and an explosive belt with them. 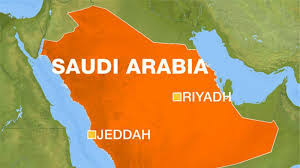 Turki said two of the plotters were identified as Abdullah Abdulrahman Abdullah Ghonaimy, 27, a Saudi citizen, and Syrian national Hussein Mohammed Ali Mohammed, 24. The spokesperson added that the passengers were recruited by ISIS to carry out suicide attacks at al-Seif restaurant in Tarout. The operation was supposed to take place on that same day at 11:00 pm. Turki confirmed that investigations are ongoing. In a related development, Turki said that another plot was set to attack the mosque of Um al-Hamam town in Qatif. Security forces were able to thwart a terrorist attack after they suspected the movement of a certain person. Later he was questioned by the security forces. At that point he tried to detonate the explosives he had in his backpack. “The man was shot outside a mosque in the town of Um al-Hamam and died while being transported to the hospital. He had explosive materials in a bag,” said the ministry of interior. Police found a Pakistani residency card on the man and investigations are still ongoing in the case. Ali Al Adi, guardian of al-Mustapha Mosque in Um Hamam, said that the pursuit happened during the Maghreb prayers. He added that security forces dealt with the situation and were able to foil the attack. Al Adi told Asharq Al-Awsat that after they were done with the prayers they received information that a terrorist was killed by security officials who contained the situation. He added that he was caught 100m away from the mosque that could fit 900 worshippers. Ali Shehab, one of al-Seif restaurant partners, told Asharq Al-Awsat that the awareness of the security men led to the arrest of the terrorists. He praised the security forces that stand in face of any terrorist attack.